How Do I Know If My Home is Sick? FREE EXPERT ENERGY INSPECTION FOR YOUR HOME! Sign up for Free No Hassle Assessment of Your Home's Needs. These windows become a captivating feature for the home. 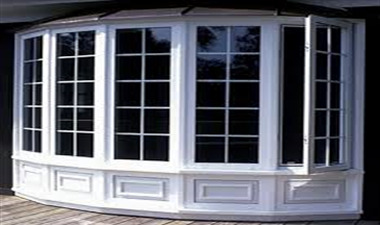 They provide customization and beauty over standard windows. You do not have to compromise energy efficiency for these beautiful windows. Bay windows usually consist of three windows. Frequently, it is a picture window in the middle with a window on either side of the picture window. They can be picture windows, casement, or operational. Bay windows are usually a three-lite (3 window) bay and usually have a 25 degree angle but can be up to a 45 degree angle. These are very popular because they provide more space on the interior of the room, and add beauty and dimension. These windows are similar to bay windows, but are a minimum of four-lites (4 windows) and can go up to five or six. Bow windows are more semi-circular in presentation and are especially suited for Victorian style homes, but not exclusively so. Bow windows are popular because they allow more light in the room. While bows do not provide as much interior space, they make up for it in the additional light, style, and beauty. Garden windows cost a little bit more, but for homeowners who like having a little "green house" in your home they are ideal. These windows are perfect for having small house plants, veggies, or herbs. Character and class are easily achieved with a bow window. 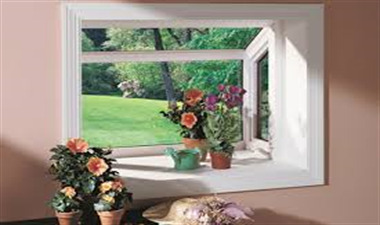 This window depicts a five-lite bow with an open casement window. Bow windows can have between 4 and 6 lites. SRI Energy is proud to offer our customers NT Windows, who has earned the government's ENERGY STAR Most Efficient Mark. The ENERGY STAR Most Efficient mark is an extension of the ENERGY STAR® brand and is designed to recognize and advance the most efficient products among those in the industry that qualify for the ENERGY STAR designation. © 2017 SRI-ENERGY. All rights reserved.